Years ago, I wore a wrist watch. 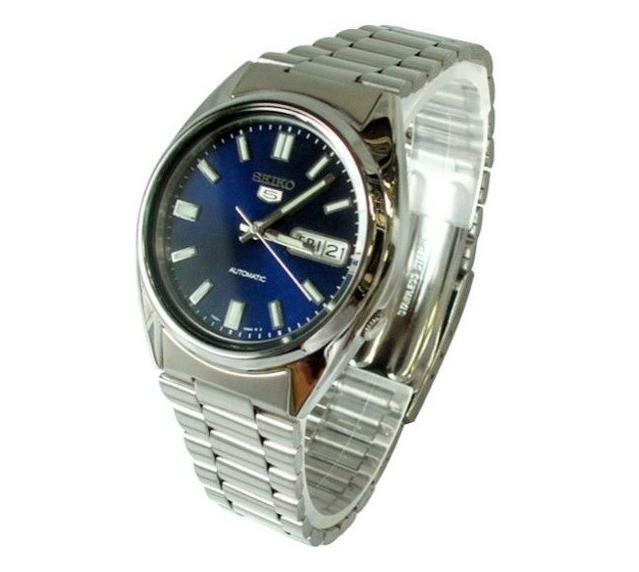 In fact, when I graduated from high school a Seiko self-winding wrist watch was my gift – I already had a car. I had that watch throughout college and it was, without a doubt, one of the most enduring things I had ever received as a gift. But alas, the metal watch band eventually broke – when I was serving in the military. And as I couldn’t see shelling out $45 for a new watch band (similar tot he one that was on it) I relegated the time piece to a junk drawer. I still have it somewhere in a box of old stuff. And, if I cared to shake it around enough to wind the thing, it still keeps time fairly well – accurate to within a minute over the course of three months and no batteries required. 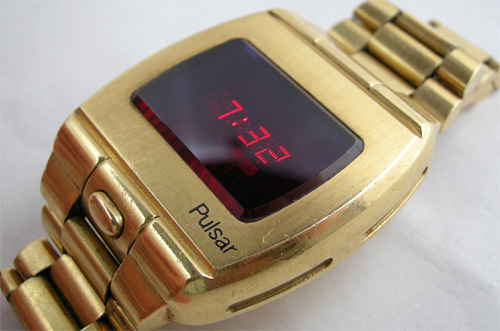 I recall that a few months after my parents awarded me with the watch Pulsar came out with a red LED wrist watch in a gold or silver case. Both models went for over a $1000 bucks. Those were the rage, a digital time piece. It was no more accurate than my Seiko but it had a cool factor and lots of people flocked to the stores to get one. A couple of years later, Pulsar was bought out by, get this, Seiko. And Seiko manufactured a line of relatively inexpensive timepieces using LCDs under the Pulsar brand name. I recall they went for around $50 to $75. I even bought one of those but I wore it only on special occasions because I really preferred my Seiko self-winding watch. 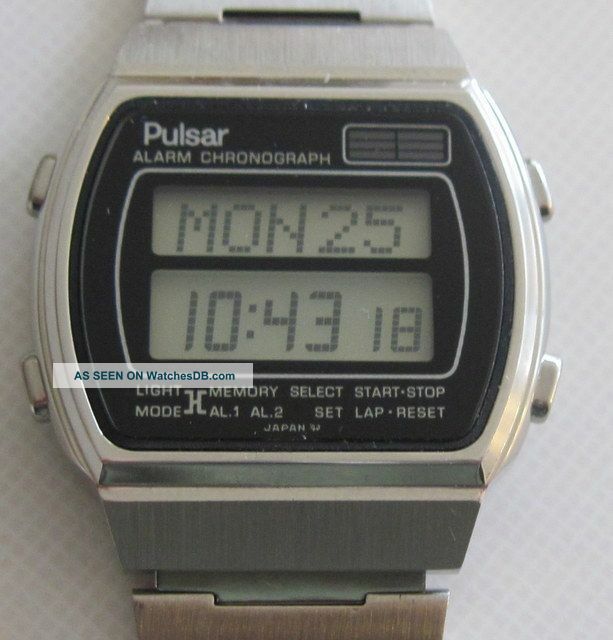 Eventually the battery died in that Pulsar watch and it ended up in my junk drawer. However, the watch band was in tact, though it was not compatible with my Seiko. After I left the military I entered retail management. I needed a wrist watch, right? I was married and had a kid with another on the way. I had places to be at a specific time. Wearing a watch helped except that I did a lot of manual labor and frequently broke the watch band. And whenever I went to look or a replacement band I discovered that I could get a new watch for less money than the watch band. And so I usually wound up carrying the watch around my pocket, broken band and all. Eventually a vendor would give me a cheap digital watch to wear, something advertising their brand. Dutifully I’d sport that on my wrist for a while, until its cheap band would snap – after all the whole thing was free, right? And why would I ever want to spend money on a replacement band for a free watch. I just waited for the next vendor with a free promotional watch. 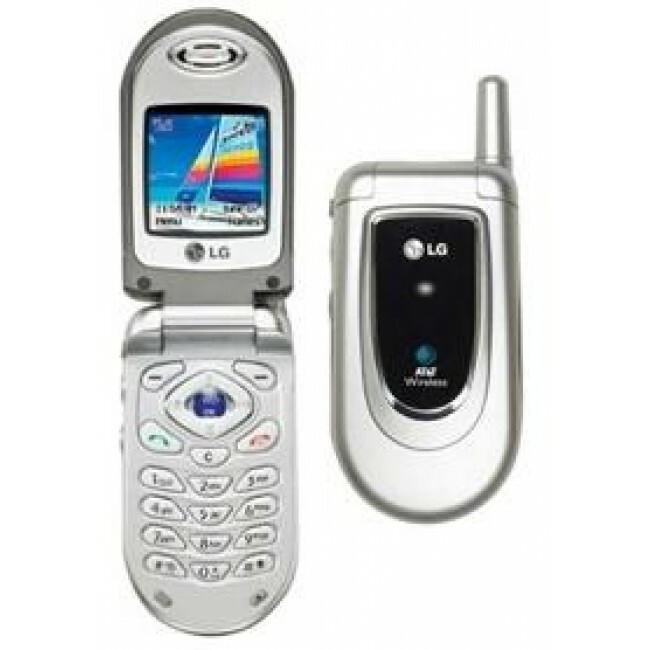 Then came the cell phone – not that I jumped onto that bandwagon early or anything. It was 1996 before I actually had one. It was large and clunky and I usually left it in my car for use in emergencies. Eventually they became smaller and I wound up with a flip phone that, on the outside when when closed, displayed the time. And so I had what essentially amounted to a pocket watch. No need for a wrist watch at all. That was when I realized how little a wrist watch was necessary. 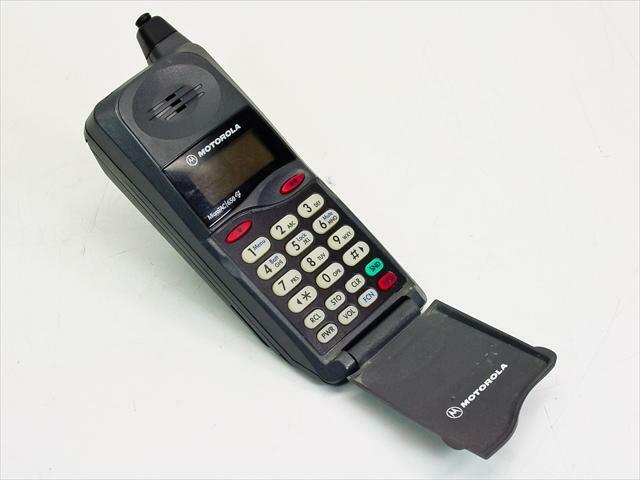 The cell phone kept more accurate time, right? I mean – it pings off the cell phone tower and self corrects to whatever signal the phone company uses – which is linked to one of the atomic clocks somewhere or the other. With the advent of the smart phone…well, I think you see where this is going. 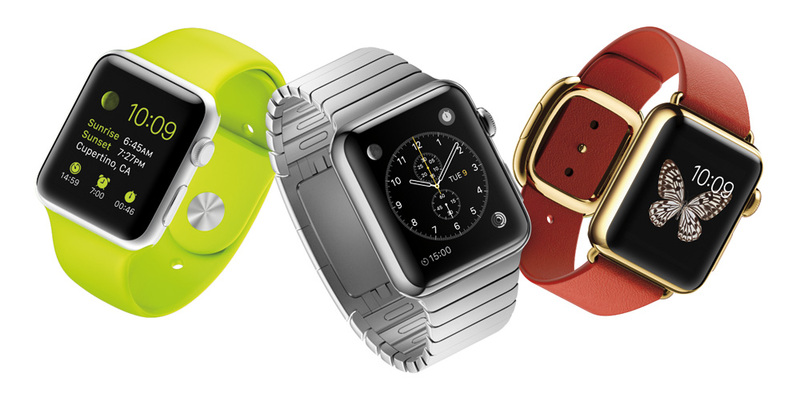 So I have to ask why would I ever want an Apple Watch except for the bragging rights? As I understand it it will have to be charged daily. So it is only for wear out in public, isn’t it? It occurs to me it’s about ostentation at least as much as functionality. You see, my smart phone does everything it can do and more – except for keeping tabs of things like how fast my heart is beating or how many miles I have walked in the course of a day. Those are things I don’t really care to know but if I did, I suppose a case could be made for the Apple Watch – There are less expensive alternatives out there. It connects with your iPhone. Well, that’s cool. So, now I can leave my iPhone in my pocket and at a glance tell the time, see my messages and access some other stuff. That might be useful, I guess, though I can’t see ever using any of those features. What does it take, two seconds to fish my phone out of my pocket? That is really why I’m not a candidate for one of the watches. Maybe, over time, the functions of the watch will prove to be of use to me. Other features will come, I’m sure, especially if the watch is popular and others attempt to copy it – just as they have done in the smart phone market that Apple essentially created. But for now, I’m not ready for the innovation. Heaven forbid I ever break the band on an Apple Watch. Although there is quite an assortment available they tend to be pricy. I’d probably end up carrying my watch around for a few minutes or hours until I realized the absurdity. 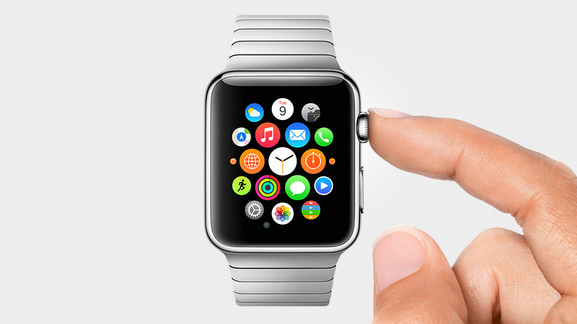 My cell phone in my pocket would make carrying around an Apple Watch in another pocket at least redundant. So, Apple: Although I am a confirmed supporter of Mac OS and own an iPad and pretty much like everything you have ever made, I don’t think the Apple Watch is for me. 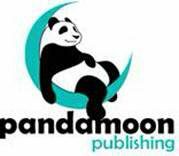 It will probably go on to revolution a market for something I don;t as yet detect but I wonder. Will it hit the mark for most other people? As far as I can tell it is the cool factor that is most compelling for the present. As I’m not necessarily cool and have not recently needed to wear a watch, I won’t be buying one. Fair enough that you don’t think it’s for you. But here’s the thing, and it comes down to your analogy: pocket watches were replaced by wrist watches. 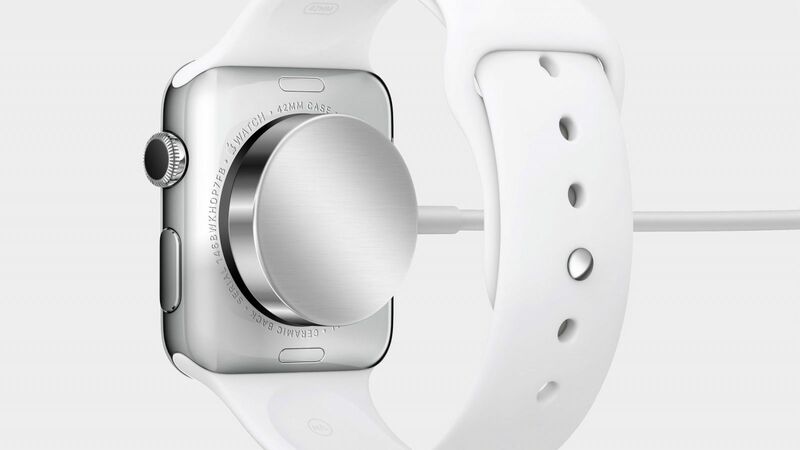 But the thing is, Apple Watch isn’t any more a watch than the iPhone is a phone. They’re computers that happen to include those functionalities, but do so much more. This isn’t about whether you need a device that tells time—this is a question of whether the utility of the device’s other features fit into your life.